EDIT: And 7 weeks later, I realised the ambiguity of my description and why Barbara asked whether it should be in the female scans sections. *hits head* I'm so slow. I made the background so yeah... most people got it so it was all fine. Just wanted to clarify it anyway. EDIT 2: 18 weeks later... I forgot to mention that the characters are from a game called 'Tarte'. Thanks to Nayako for the info! the wallpaper looks very beautiful, the background has nice effects and it suits the charas. Well done, and I love the effects, simple yet effective. Gives off a good warm feeling when I see it :) two thumbs up for you! 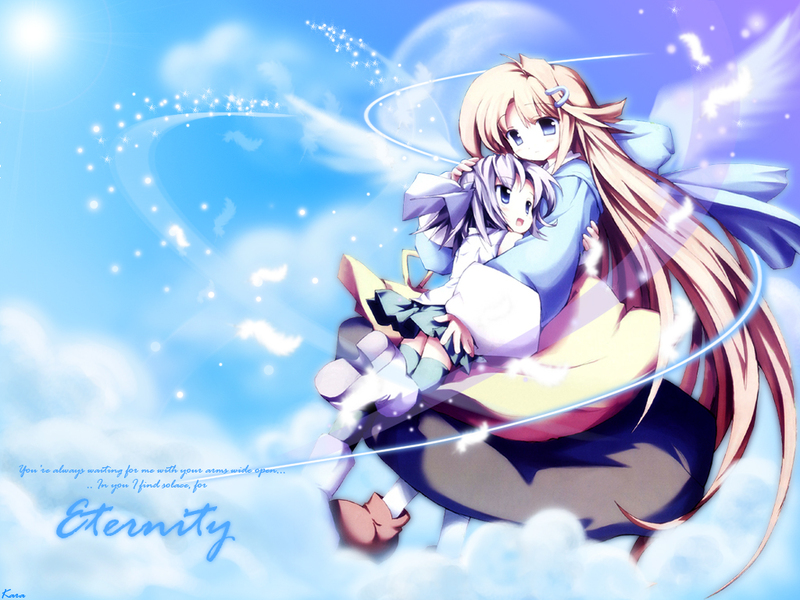 nice wallie, the cloud look clam and soft! indeed! its a very cool feeling wall. very light colors and its not blinding either. Yey!!! It looks so sweet!!! Great work with the wallie!!! XD If I remeber correctly these girls are from game entitled "Tarte" :) Anyway, really good work!! I think it's beautifull.The colours blend well the moon is good and the sparkly bits look kool.Alltogether good job ^^. Nice wall I like the background with the blue sky and the clouds. Also the girls are preaty cute. Nice job keep it up, Fav. Very nice background but is it supposed to be on Female Scans??? wow! nice scan! i like it very much!! the clouds are soo fluffy! the sky and the moon is soft! the wings and the feathers are soo pretty! the glowing things and the swirly thing is so cool! and the text really fit it!! this wall is great!+fav! Really calm looking wall. The purple ribbon thingy going through the scan doesn't fit well so as the small sun which looks really weird. I think just light would've been better. It's a nice wall anyway. anyway keep up the good work and make them at least in 1280X1024. hope to see some other works of you later! dayumz, this is one good looking wallie! the colour scheme and all is realli nice and fits well together! i jus love blu n purple..:D and the sparkly effects are nice, u didnt go overboard! this is probably your best work ! :) keep it up!